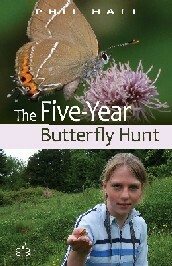 The author and his young daughter, who set off on a holiday in West Wales to observe whales and dolphins, stumble across the delights of Britain's native butterflies. Inspired, they start a quest to photograph all of the 58 breeding butterfly species in the UK, leading to an adventure that lasts five summers. After the worst weather experienced in early summer for many years, hope dawned on the horizon as favourable weather conditions were forecast for Saturday 7th July. This memorable date (07-07-07) became indelibly marked on my memory as the day I encountered possibly Britain’s most eulogised butterfly, the Purple Emperor. Unfortunately, with Vicki otherwise engaged, no doubt on equine matters, I journeyed alone to Bentley Wood and arrived full of anticipation just before 10am. I was amazed to find the car park almost full, such is the crowd pulling power of ‘his imperial majesty’. With my Duke craving unfulfilled and a free weekend looming, I thought it would be fun to try somewhere I had not visited before. My Wiltshire Wildlife Trust magazine had arrived a few days earlier and contained a really impressive article about a reserve near Calne named Morgan’s Hill. In keeping with many West Country landmarks, the name is derived from a hanging. Morgan had been hanged at the top of his hill, visible in all directions so that all could see and be discouraged from committing similar crimes, whatever they may have been. I again mentioned to Chris Iles, fellow enthusiast from Midsomer Norton, my frustration and lack of success with the White-letter Hairstreak and asked him to tip me off if he found any suitable sites where photography was possible. He rang me on Sunday 11th July to check how I was getting on with our transect survey at Stratton (I now bore sole responsibility for recording) and announced he’d discovered a colony at Tunley, literally on our doorstep, less than ten minutes drive away! The first knowledge I had of this book was a phone message taken by my wife from Phil Hall. He told her that he was sending me a copy of his book for the help I had given him to encourage his initial interest in butterflies. The small volume arrived and I soon recalled the first meetings with him and his young daughter at Thurlbear and other local sites. He has a family and runs his own business so his plan to locate and photograph all the British species was ambitious. He had to juggle school holidays, children’s interests, business workload and entertaining his wife together with species flight times. I found the accounts of his five-year project both entertaining and informative. As with all nature, an amount of luck is required in pursuit of an elusive species. Phil describes in detail and with keen observation both his success and failures in finding butterflies and other wildlife. This accompanied by an often humorous text makes for a good read. He lists at the back of the book a list of his favourite butterfly locations with the reasons for his choice. There is also a list of species with the location of their photographs. Altogether it is well worth a read. The book is obtainable from Brambley books prices at £8.99. This is charming account of one man’s quest to see and photograph all our native butterflies during 2006-10. Often accompanied by daughter Vicki (whose pendant for viewing dolphins provides an added pleasure), we are taken on an enthusiastic journey of discovery throughout Great Britain, to sites both well-known and less familiar to butterfly experts, that culminates in Hall’s last gasp sighting of the Mountain Ringlet on Ben Lawers and in eventually obtaining fine photographs of White-letter Hairstreaks back home in Somerset. Starting with little knowledge of butterflies or of their habitats, we share Halls burgeoning enthusiasm, enjoyment and growing expertise as he juggles with logistics – geographical, seasonal and often hindered by bad weather – familiar to every butterfly watcher who has attempted this challenge. With a series of trip accounts and more than 50 (rather indistinct) black-and-white photographs, this is a well-crafted, easily-read book that will give pleasure especially to beginners among butterfly watchers.